Nation state borders are not above contention, and have shifted often in even the medium term due to both political and economic disputes. This column shows how the formation of the German state can be traced back to British intervention in treaty talks at the end of the Napoleonic War. In preventing Russia from gaining territory westwards, Britain set in motion a series of events that gave Prussia strategic trade advantages that allowed it to create a customs union which would go on to form the German state. The boundaries of states are the heart of many recent debates, be it the European refugee crisis, the Transatlantic Trade and Investment Partnership (TTIP), or Brexit (Snower and Langhammer 2019). After decades of stability, today we are again seeing heated discussions about the shape and extent of political borders. Clearly, borders are neither naturally given nor random. In Europe and elsewhere, the current state borders have been formed and changed over centuries, sometimes peacefully, often in bloody wars. 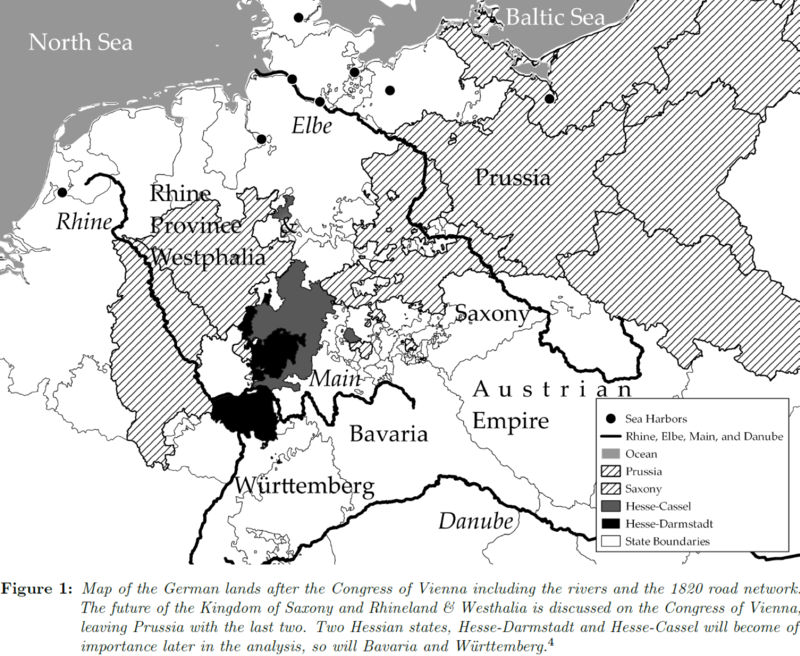 In Huning and Wolf (2019), we look at the formation of the German nation state led by Prussia and trace it back to a change in borders decided at the Congress of Vienna in 1814/15. First, the geographic position of a state can be a crucial factor for institutional change and development. Second, the formation of the German Zollverein in 1834 under Prussian leadership was a truly European story, involving Britain, the Russian Empire, and the Belgian revolution of 1830/31. We show in particular that the Zollverein formed as an unintended consequence of Britain’s intervention in 1814/15 to push back Russian influence over Europe. In theory, why would the geographic position of a state relative to that of other states matter? Intuitively, it should matter as long as the costs of trade and factor flows depend on their routes. If a large share of my trade has to pass the territory of one or several neighbours, my trade and trade policy will depend on the trade policy of my neighbours. Moreover, if tariffs are levied not only on imports but also on transit trade, as was general practice until the Barcelona Statute of 1921 (Uprety 2006), policymakers face the problem of multiple marginalisation, which is well known from the literature on supply chains. In our work, we provide a simple theoretical framework (in partial equilibrium) to show how the location of a revenue maximising state planner will affect its ability to set tariffs. Some states can increase their tariff revenue at the expense of their hinterland. Next, we show that a customs union can be beneficial for a group of states exactly because it solves the problem of multiple marginalisation. A major challenge to testing our idea empirically is that a state’s political boundaries (and hence its location) do not change very often, and if they do, the change is unlikely to be unrelated to trade or factor flows. However, the formation of the German Zollverein in 1834 can be considered as a quasi-experiment. Let us briefly revisit this historical episode. At the end of the Napoleonic wars of 1792-1814/15, only Russia and the UK were left as major military powers. Habsburg, Prussia, and the defeated France attempted to consolidate their positions at the expense of the many smaller states that had just about survived the wars, notably the former allies of Napoleon such as Saxony and Poland. Overall, the negotiations at the Congress of Vienna in 1814 were dominated by military-strategic considerations between the two great powers. Russia wanted to expand westwards, Prussia was desperate to annex the populous Kingdom of Saxony, which bordered Prussia in the south and would create a large and coherent territory. To this end, Prussia was willing to give up not only her Polish territories to Russia, but also her positions and claims on the Rhineland (Müller 1986). This met stiff resistance from Britain, joined by Habsburg and France, which feared a new Russian hegemony on the continent – the ‘Polish Saxon question’. After weeks of diplomatic struggle, the outcome was a division of Saxony, another division of Poland and Prussia being established as the “warden of the German gate against France” (Clapham 1921: 98). Figure 1 shows the result of these negotiations. The Prussian territory was split into an eastern and a western part, divided by the small Hessian states. “Berlin failed to get what it wanted and got what it did not want… The creation of a large Western wedge along the river Rhine was a British, not a Prussian, idea” (Clark 2007: 389). While this was initially considered a diplomatic disaster for Prussia, we also see from Figure 1 that Prussia now controlled large parts of Germany’s most important navigable waterways to the sea, the Elbe and the Rhine. Prussia started to take advantage of this position with the tariff law of 1818, which abolished all internal tariffs and established a uniform external tariff, including transit tariffs. From there on traders in the southern states were forced to either detour the large Prussian territory, typically over Hessian land, or accept the transit tollage. Given that in the early 19th century, transport on water was much cheaper than transport over land, this came at a large physical detour cost. According to Sombart (1902), the average freight cost per tonne-kilometre on water was 0.6-1.5% (!) of the freight cost on country roads, or 25% of that on paved state roads. But road construction was slow and expensive and railroad construction would not start before the 1840s. Hence trade was routed along waterways, especially trade in colonial goods, which had to be imported from overseas. In turn, revenue from colonial goods – notably sugar, tobacco, and wine – accounted for 80% of the Prussian tariff revenue in 1831 (Onishi 1973), and similar shares could be found elsewhere. Prussia was interested in tariff revenue, but also in establishing a land bridge between the two parts of her territory. As Prussia started to negotiate a customs union with the Hessian states, this was vigorously opposed by the southern states (Bavaria and Württemberg), who feared becoming hostage to Prussian tariff policy. But it was equally opposed by Habsburg and Hanover (in personal union with the UK). Notably, the Habsburg chancellor Metternich feared that a customs union under Prussian leadership would be a first step towards a political expansion of Prussia. In hindsight we know that he was right. Nevertheless, Prussia succeeded in forming a customs union with Hesse-Darmstadt in 1828. One major factor that limited the bargaining power of Prussia in the late 1820s was the fact that the Netherlands controlled Rotterdam, the mouth of the Rhine river. Trade on the Rhine was subject to tariffs and duties payable at Rotterdam, as well as staple rights and the requirement to use Dutch shipping companies (Spaulding 2011). It was the Belgian revolution and the prospective competition from an independent Belgium that led to an agreement between Prussia and the Netherlands to reduce these trade costs in March 1831. After this, transit trade over the land of Hesse-Cassel was sharply reduced. In August 1831, Hesse-Cassel joined the Prussian customs union, which provided the desired land bridge between the two Prussian territories. In 1833, Bavaria and Württemberg followed, and in 1834 the German Zollverein was formed. In our paper, we show that our theoretical framework can explain this series of events very well. First, controlling for a host of alternative explanations, we provide evidence that states for which the least-cost path to the North Sea or Baltic led via Prussia entered the Zollverein earlier. We also show that this transit captures the effect of distance to the ocean, which has been proposed as an instrumental variable for access to the Zollverein (Keller and Shiue 2014). Moreover, we use historical data on prices, freight rate, and market sizes to calibrate our theoretical model and simulate tariff revenues under the various customs unions. We can show how and why the formation of a customs union between Hesse-Darmstadt and Prussia in 1828 and again the opening of the Rhine trade in 1831 had large effects on tariff revenues of other states (Ploeckl 2015). Finally, we simulate our model under counterfactual borders – what if Prussia had got what it wanted in 1815, namely, the entire Kingdom of Saxony at the expense of creating an independent Rhine-state? We show that with such borders, the German Zollverein would very likely not have been formed. Put differently, as a collateral damage to her intervention at Vienna in 1815, Britain unified Germany.